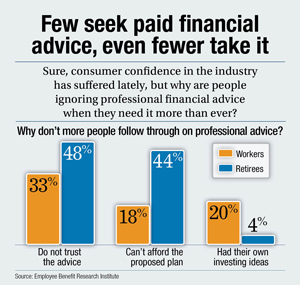 So why dont more workers follow through on the advice of the paid pros? Lack of trust is one big reason. Once again proving the adage about leading horses to water, just 23 percent of U.S. workers report they have sought investment advice from a paid financial professional. And of that portion, only 27 percent claimed they followed the advice entirely, according to a study from the Employee Benefit Research Institute.